The movement against apartheid inspired and mobilised people throughout the world. The ending of that racist system was a great victory, even if today the poor in South Africa are still facing repression (such as the massacre at Markikana mine last year). 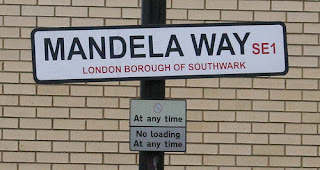 At the peak of the anti-apartheid movement in the 1980s, streets and buildings across London were named after Nelson Mandela and others involved in the struggle - mostly by Councils who were denounced at the time as 'loony left' for so doing. So while Nelson Mandela has gone, the memory of him and the wider movement will be preserved on the streets of the capital for decades, possibly centuries, to come. 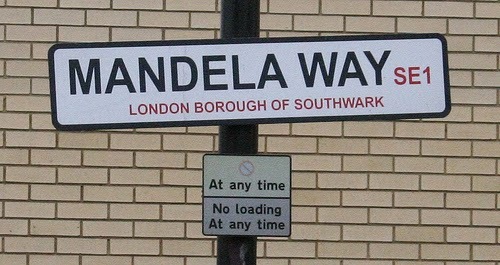 In South London there is Mandela Way SE1 off the Old Kent Road, home to the post sorting office and Tate store. There's a Mandela Street SW9, off Brixton Road towards the Oval (Mandela famously visited Brixton in 1996). There's also Mandela House in Pendrell Street SE18 and of course (the fictional) Nelson Mandela House tower block in Peckham, home to the Trotters in 1980s TV Sitcom 'Only Fools and Horses'! The Pelican House development in Peckham is on the site and retains the frontage of a Council building that was named for a while as Winnie Mandela House. Nelson Mandela's former wife is a more controversial figure, though you could argue that while Nelson doubtless suffered terribly in prison he was able to retain his saintly image by not having to be as involved as Winnie was in the messy and violent business of dealing with police massacres, armed resistance and informers on the streets of Soweto in the 1970s and 1980s. There are also four UK streets named after Steve Biko, the anti-apartheid activist killed in police custody in 1977. One of these is Steve Biko Lane in Bellingham, which was visited recently by his son Nkosinathi Biko (pictured below) as part of a Phoenix Black History Month event.